Hilde Lysiak made national news a few years ago when she broke a hometown homicide story in her newspaper, the Orange Street News. 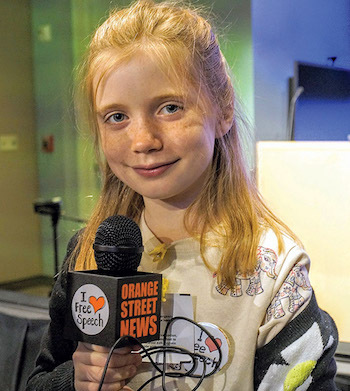 Named after the street she lives on, the Orange Street News is a family production, led by Lysiak. Now, she’s writing books in addition to reporting and publishing the only monthly newspaper in Selinsgrove, Pennsylvania — and she’s only 10 years old. SPJ spoke to Lysiak about the Orange Street News, journalism and her most memorable reporting experience. How has the Orange Street News changed since you first started it in 2014? When I began the Orange Street News, I was 7 and a little bit shy. My first front-page story was about when my mom gave birth to my baby sister. Then I branched out a little bit and started knocking on the doors on my block to look for stories. Today, I take pride in reporting on all of Selinsgrove and in having stories that give the community important information. I’ve been working on an investigation on the problem with hard drugs like heroin at the Selinsgrove High School. And I was the only one reporting on corruption at my local fire station. I’ve seen first-hand that my reporting is making a real difference in my community. What are your goals for the Orange Street News now that you’re getting older? I want to be able to cover more crime stories. I’ve been reporting on hard drugs recently, but there have been leads I haven’t been able to follow because of my age. I’m excited for the day when I don’t have to ask my parents for permission to go places. I also want to do a jailhouse interview one day. When did you realize you loved reporting? I don’t remember a time when I didn’t love reporting! My dad (Matthew Lysiak) worked as a reporter for the New York Daily News, and for as long as I could remember, I would go with him on assignment. His life always seemed so exciting. I knew it was what I wanted to do, too. How do you manage the workload of the Orange Street News? I really don’t feel like it’s work. If I find a story to be boring, I know the reader will too, so I always try to keep it interesting! I start working on a story first thing in the morning; I am usually done with my reporting and writing by 2 p.m. I see that your sister is now a part of it with her columns and doing multimedia. What is it like working with your sister? My sister Izzy does the social media for the Orange Street News, and she tapes and edits my reporting videos. She is great! But the best part of having a sister that works for me is that I get to boss her around. I pay her $25 a week. What are some challenges you face as a young reporter, and how do you overcome them? How does being a member of SPJ help you? Even before I joined SPJ, SPJ helped me by offering support when others were saying I shouldn’t be doing what I was doing. Since becoming a member, I haven’t needed help yet. But it’s good to know they are there in case something happens. What’s the most memorable story you’ve reported? I know everyone thinks I’ll say it is how I broke the story on the homicide. But truthfully, that was a pretty easy story to cover. A source had given me the information, and I was able to confirm it quickly — hours before other media reported it. Where do you find inspiration for your book series, “Hilde Cracks the Case”? I think the stories have turned out amazing! My little sister Georgie is 5 years old, and she is addicted to them. After reading the books, she wants to be a reporter now, too. I hope other kids are inspired like my sister was! How does your writing process differ from reporting to writing your books? In the Orange Street News, everything I write has to be fact-based. But “Hilde Cracks the Case” is a fiction book series, so I can make up a lot of stuff as I write. Also, I write the Orange Street News all by myself, but I get a lot of help on the book. My dad helps me, and my editor Katie Carella works really hard to make the story great. There is also an amazing illustrator, Joanne Lew-Vriethoff, who brings each word to life through art! For the Orange Street News, I don’t have an editor or artist. I do get writer’s block. I always feel like if I can get the first sentence out, then after that everything will get easier. If that still doesn’t work, I like to go on a walk. Then I come back to the story later with fresh eyes. With so many things to balance, plus school, how do you stay organized? I don’t. You should see my desk. If you could interview anyone, dead or alive, who would it be, and why? Nellie Bly. She was one of the first female reporters. She was very aggressive and fearless; I have a lot of respect for her. She pretended to be crazy so that she could report on the abuses going on at a mental institution. I would want to ask her lots of questions and hear everything about her life. Do you have any advice for current journalists? If I had to offer one piece of advice, I would say that reporters should always do whatever it takes to stay focused on getting to the truth. Don’t pay any attention to the haters. They just zap your energy. I’m obsessed with Taylor Swift. I also like making slime. What do you have to say to people who undermine young people’s dreams and goals? My parents are great. I know I get angry when they don’t let me do my job sometimes, but I was the only 7-year-old I knew who was allowed to ride her bike all over town. If they hadn’t given me that freedom, I wouldn’t be able to report the news like I do. Sometimes I think the best thing parents can do is to get out of the way. What’s your favorite thing about journalism? I’m working my dream job right now. Now that the Orange Street News is almost three years old, you have three more books coming out and you’re almost 11, what’s next? I think a reporter is only as good as her last story. I want to keep getting better at reporting. I want to keep growing.